Garters make a corset more fun. I've decided to make the garters on this corset extra festive and cover them with aqua satin to match the bias trim. Covering the elastic is the same process no matter what width of garter hardware you are working with, you just make a tube of fabric that's cut longer than the elastic and slip the elastic inside. For these garters the covering is 11 inches long and the elastic is 7 inches, so it ruffles up but is not too bulky. I often use bias trim to cover garters, just lay two 2 inch wide pieces together and stitch the length on both sides. The example is on the left in the photo below. For this corset I'm using pre-made satin binding because it was the only thing in all of JoAnn Fabrics that was the right shade of blue. It's silly to cut it the binding half and sew seams on both sides, so the satin is folded in half with a seam on one side. The example is in the center below. The end result for either technique is the same, a tube as wide as the garter hardware. Of course the seam allowance should be pressed open. I have a wooden spoon that is only used to press seam allowances on tubes of fabric. It's the perfect tool for the job. Trim the seam allowance to 1/8 inch and pull the tube right side out. Depending on how slippery your fabric is this may involve some swearing. Then press again. The elastic doesn't need to be as wide as the fabric covering it. I'm using 1 inch wide elastic and the fabric tube cover is 1 1/2 inches wide, so I sewed 1/4 inch from each side leaving just enough space for the elastic in the center. Pull the elastic through the tube and sew together at one end. Bunch the covering up and trim the elastic to 7 inches. Don't cut a 7 inch piece of elastic first then slide it into the covering. Fishing out the short end is tedious. I know because I've done it. After you've trimmed the elastic secure it to the fabric at the other end. Here's the covered elastic next to the tool used to pull it through, and also used for turning fabric tubes right side out. It makes those tasks much quicker than pushing things with a pencil or grasping with pliers. The steps for assembling the garter hardware to the elastic are here. I couldn't write them any better a second time. Below is a partially constructed garter and a finished one. How many of you sewing along are covering your garters? Ok, I'm still behind, but catching up as quick as I can. I'm up to sewing on the bone casings on the post edwardian pattern. I'm still not sure about the location of the bones- are there two 1/4 in bones on either side of seams 1,2 and 4 or just one bone? Sorry to ask, feeling like a bit of a 'bonehead' atm. There is one bone on each side seams 1,2, and 4, so two bones to a casing. Does that help. You're catching up so quickly! Thank you, that's exactly what I was asking. Sorry to be such a pain! I am failing at sourcing the adjuster part of the garter hardware. I have everything else. I am certain that my search terminology is incorrect, and none of my normal lingerie supply houses have them. I found them at Vena Cava, but that seems silly to order them all the way from the UK. Any suggestions? 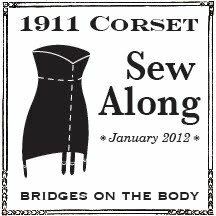 I envy everyone who has a corsetry shop or lingerie supply house anywhere near them. I have to order everything from Vena Cava which is a quarter of a planet away: Africa is apparently not big on corsetry! You can make garters with the grip part only, there are period corsets without the adjustor hardware. At regular fabric stores like JoAnn's there should be garters in the notion section. I know Dritz makes some that I've seen there. You can change or cover the elastic to suit you needs. I have been wondering, just how necessary are the garters as a means of keeping the corset from riding up? I would just as soon not bother making them if I don't need them, and this is the only purpose I can think of that I might need them for, since my shape is so tubular. I want to know this too: I'm planning to make an evening gown that can go UNDER the corset (far be it from me to be historically correct...) so there will be nothing for me to attach the garters to. Having said that, I think i will make detachable garters for just in case I want to wear it like it was intended. Aside for generally anchoring the corset down the garters will keep the skirt part below the hips from wrinkling and folding up. When you sit the center front will split open and when you stand the garters will pull the fabric back into place. If the dress or skirt is loose this may not pose a problem, but if it's cut closely through the thighs it could definitely affect the look and fit of your garment. I just ordered garters from SewSassy.com. They're listed under the bra section. It looks like they might have the grip part, but I'm not sure. I like that they're wider than those available at Jo-Ann. a wooden spoon to press tube seams ... GENIUS! Could you tell which is the tool you use in photo 5? Thanks! That long latch hook is called a loop turner. They are sooooo helpful.